A shallow angle of ascent provides for an uptrend’s longevity. But as it ramps higher at a steeper and steeper slope, then the trend is either about to end or reverse. 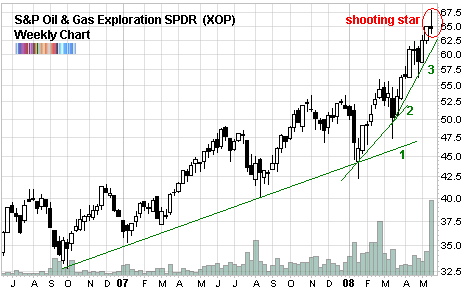 You can see in the case of S&P Oil & Gas Exploration SPDR (XOP) ETF that the uptrend has changed slope three times. Each time becoming steeper. According to traditional technical analysis this is a sign of exhaustion. No trend can sustain itself for much longer once it has intensified three times. Another important element is the formation of a shooting star candlestick formation on the weekly chart. This is another sign of impending trend exhaustion. It is significant only after an uptrend. You can find others on the chart, for example the first week of November 2007. Think of shooting stars as inverted hammer candlesticks. Just as hammers are bullish when they occur after a downtrend, so are shooting stars bearish after an uptrend. The technical for this chart is interesting. The question that I would like to know is that are the 3 counts of XOP counting from the supporting or resistant point? brandon, I’m not sure what you mean but those lines are support lines. Babak; If this were to reverse, to what level would seem “likely” given its current trend? 55 “ish”, and thereby a break of trend, or mini pull-back to 62.5 then to resume? Is the third increase angle of ascent you speak of usually shorter (in time) than the two proceeding…as a general rule? What indicates that a trend has changed slope? It seems that the trendline is averaged over a period of time which becomes ever shorter as you move from period 1 to 2 and 3. For the TLs plotted over shorter periods of time you will find greater sensitivity to price changes and hence higher likelihood of a trend changing slope. Bruce, the first trendline would be a logical place, which would mean around $50. But I wouldn’t be surprised to see it break hard since such a ramp up is indicative of a lot of speculative froth and “fast money”. Al, you may be right but the same trendline (1) is in effect if we start out in August 2007 instead of October 2006. Thank you for that view…. A good reversal in the oil stocks (and miners generally) one would think bodes well for the rest of the market. There certainly appears to be “paralysis” elsewhere in the market due in particular to oil… Hopefully “fundamentals” will be restored, sooner rather than later in matters oily! !